There are two main problems with Churchland’s discussion. First, his summary of the case for dualism is no good. Second, his arguments against dualism are no good either. In this post we’ll look at the first problem and in a second post I’ll address the second. What are the main arguments for dualism? Churchland identifies four; he calls them the argument from religion, the argument from introspection, the argument from irreducibility, and the argument from parapsychology. To anyone familiar with the philosophical literature on dualism, this list cannot fail to seem very odd. The “argument from parapsychology” no doubt does have some defenders; certainly there are serious philosophers who have taken the subject of alleged paranormal phenomena seriously either in a sympathetic way (e.g. C. D. Broad and, in recent years, Stephen Braude) or in a critical spirit (e.g. Antony Flew). But this subject does not in fact play much of a role in contemporary debates over dualism, and even those philosophers who believe that at least some purported paranormal phenomena cannot plausibly be explained away in terms of existing scientific theory (e.g. Braude) do not necessarily put such claims forward, primarily or at all, as grounds for accepting dualism. What is in fact the chief argument for dualism, at least from the point of view of the classical (Platonic-Aristotelian-Thomistic-Scholastic) traditions in philosophy, concerns, not sensory qualities or “qualia,” but rather our capacity for abstract thought. For concepts, and our thoughts about them, are universal in a way nothing material can be, and (sometimes, anyway) determinate, precise, or unambiguous in a way nothing material can be. (I have discussed this sort of argument too in many earlier posts, e.g. here and here.) While this line of argument has also been largely ignored by contemporary academic philosophers of mind, it was defended by Mortimer Adler in the years leading up to the publication of Churchland’s book, and by 20th century Thomist writers generally. Needless to say, Churchland ignores it as well. So, while Churchland pretends to be summing up “some of the main considerations” usually given in support of dualism, he completely ignores the arguments the most prominent dualist philosophers actually regarded as the most important, and includes arguments that dualists do not typically make use of – arguments that are either clearly feeble (the “argument from religion,” as Churchland presents it) or which rest on premises which are as controversial as dualism itself is (the “argument from parapsychology”). The rhetorical effect is obvious: The unwary reader, who assumes that a textbook will give him an accurate summary of what each side has to say, is bound to come away with a completely distorted conception of the case for dualism. In particular, he is bound to think it far weaker than it actually is. Having said all that, Churchland is at least correct to say that what he calls the "argument from introspection" and the "argument from irreducibility" are prominent arguments for dualism. Unfortunately, what he says about these arguments is no good either. We’ll see why in part II. In keeping with the present theme, I would suggest looking at this article by Mark Crooks, which catalogs to devastating effect the fallacies, non-sequiturs, and blatant inconsistencies that appear in the Churchlands' writings on phenomenal consciousness. "What are the main arguments for dualism? Churchland identifies four; he calls them the argument from religion, the argument from introspection, the argument from irreducibility, and the argument from parapsychology." Egads, that's from a TEXTBOOK?? As in, a text that philosophy students (and thus, future philosophy professors) are taught from as authoritative? I'm sure there's a foreign word--probably German--for something that is at once so egregious and heart-breakingly sad. See my late colleague Mortimer Adler's book, Intellect: Mind Over Matter. Given that you mentioned Dretske, I wonder what you think of his approach to philosophy of mind? Specifically his claim that, contra the EM sorts, that (if I have him right) nature is already rife with intentionality as is? On the one hand, it sounds a lot like what you say, in my brief encounter with his writing. No doubt Churchland takes himself to be summarizing the "most common arguments" for dualism not just among philosophers, but among all people who believe in some form of dualism. If so, then it's more plausible that the arguments from religion and parapsychology are relatively common. In my experience, many people do have thoughts such as "people must have immaterial souls that survive the death of their bodies because so many people [or I myself] have had paranormal experiences" and "people must be able to survive their deaths because otherwise my religion makes no sense, and I can't take that option seriously." I doubt that very many people even come close to formalizing these thoughts into arguments, and they obviously don't fare well as such, at least not on their own. The obvious question is why they should occupy more than a dismissive footnote in a book on the philosophy of mind. No doubt the answer is that Churchland hasn't read any serious dualist arguments and so can't distinguish between them and the half-reflective, half-intuitive thought of non-philosophical dualists (who, according to some surveys, greatly outnumber theists in Britain and the United States). I'm also curious about Ed's thoughts on Dretske. From what little I've read, I have a hard time telling whether he thinks that "nature is already rife with intentionality" or thinks intentionality can be reduced to non-intentional causal relations. On the one hand, he does give the impression that he thinks he can naturalize the mind because many of the crucial features of mind are not unique to it. On the other hand, he does echo Fodor's claim that intentionality must be something else, which doesn't sound like a claim that nature is rife with intentionality as it is (though one wonders how he can avoid Searle's objections to naturalized intentionality without being a realist about functions and teleology). In short, I'm confused, and I'm not sufficiently persuaded that it would be worth the time to find out what Dretske actually thinks in detail. I think the "argument from parapsychology" is reasonably defensible as an empirical support to dualism. Materialists have not refuted the best evidence for laboratory-based research on psi phenomena, and when pushed against a corner, they have been forced to dismiss the phenomena on philosophical and rhetorical grounds. "I agree that by the standards of any other area of science that remote viewing is proven, but begs the question: do we need higher standards of evidence when we study the paranormal? I think we do. "Because remote viewing is such an outlandish claim that will revolutionise the world, we need overwhelming evidence before we draw any conclusions. Right now we don't have that evidence"
Note that Wiseman doesn't dispute the quality of the evidence and research in remote viewing. He rejects it only because, according to his opinion, it's "extraordinary" and hence the evidence is insufficient (note that he doesn't specify what would be "sufficient" to him). But as top empirical parapsychologist Dean Radin has replied: "Thus, a prominent skeptic agrees that (1) the study of remote viewing is an area of science, which should thoroughly obviate the skeptical epithet of "pseudoscience" once and for all. And (2) that when judged against prevailing scientific standards for evaluating evidence, he agrees that remote viewing is proven. The follow-on argument that this phenomenon is so unusual that it requires more evidence refers not to evidence per se, or even to scientific methods or practice, but to assumptions about the fabric of reality"
An obvious question to Wiseman is: if remote viewing doesn't exist, how does he explain that it has been proven by the standards of science? These "evidence-based" materialists like Wiseman or Churchland accept the evidence only when it confirms their materialistic worldview (e.g. that psi doesn't exist). -David Lund, professor of philosophy at Bemidji State University. He's specialized in philosophy of mind. His lastest book entitled "Persons, Souls and Death: A Philosophical Investigation of an Afterlife" is a powerful philosophical defense of the evidence for dualism and the afterlife. An addendum to my above comment. "What we have found, for example, is that if you place two different brains, two different people at a distance, you put a circular magnetic field around both. There’s a magnetic field going around like a coil, around both brains even at a distance. You make sure both coils are connected to the same computer which means they’re generating the same configuration of two different spaces. If you flash a light in one person’s eye, even though they’re in a chamber that’s closed up, the person in the other room that’s receiving just the magnetic field now, they’re not aware of the light flashing or not, they will show similar changes in frequency in the room. And we think that’s tremendous because that maybe the first macro demonstration of a quantum connection or so-called quantum entanglement. For a discussion of the so-called quantum entanglement and its possible relevance for parapsychological phenomena, see Dean Radin's book Entangled Minds. Thanks for your comment. Adler's Intellect is indeed a fine and important book, as is its predecessor The Difference of Man and the Difference it Makes. I recently read about your association with Adler in Alex Beam's book about the Great Books. Though Beam's book is entertaining and seems to be a useful source of information, I must say that I was appalled by Beam's condescending tone vis-a-vis Adler. I myself admire Adler a great deal, and those of us who value the Aristotelian-Thomistic tradition are in his debt. Re: Dretske, he is one of several contemporary philosophers of mind who seem not to realize that if they are serious about there being natural processes that have something like intentionality, only divorced from consciousness, then they are essentially returning to what the Scholastics meant by final causality. This is something I discuss in the last chapter of The Last Superstition, though I don't discuss Dretske specifically. 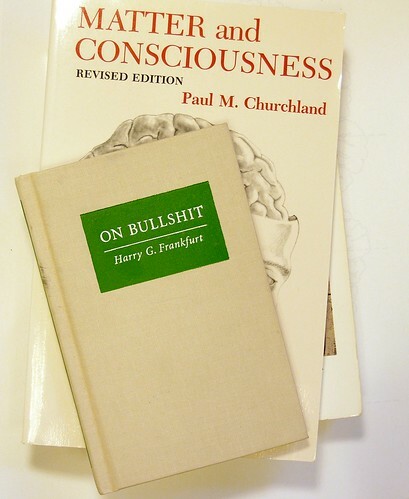 I have a friend who studies at UT Austin and told me that when he had a philosophy of mind class with Michael Tye, Tye presented only these arguments in favor of dualism (do I have to mention that M&C by Churchland was on their required readings list?). Yes, Michael Tye taught the argument from religion to one of his classes. Michael Tye. At UT Austin. I wish I was making this up, but I'm not. In fact, Smith and Jones' treatment is not only not very convincing, but looking increasingly creaky: it does not discuss arguments from Hart, Foster, Plantinga, Swinburne . . . I think they only really deal with Descartes! Maybe after you've finished pounding on the eliminative materialists (I'm learning quite a lot from this recent post series, so I suppose I indirectly have Rosenberg to thank!) you can talk more about modern philosophers (accidentally?) returning to something akin to the scholastic/Aristotlean perspective about nature, etc. What TLS said about Dennett and company absolutely floored me. As did other parts of the book, but that stood out in particular. They have not read the book, but dismiss it in advance based on reviews or prejudices. It would be interesting that Dawkins would comment something about TLS, but I doubt he'll do it, because he seems to like to engage with straw men and easy targets (like Paley) alone. "The hegemony of atheism and materialism crucially depend on a stubborn and studied ignorance of what theists and dualists have actually said.)" Ed, I have repeatedly raised process thought/theology concepts in comparison and contrast to your points of discussion, and asked that you and/or other commenters reply…I mostly hear echoes in the theistic-scholastic chamber. I see this as the same behavior and mindset of which you accuse Churchland. Whoa, hold on a second there Burl. That's not exactly a fair reply. Dr. Feser's post--and the quote you mined from it--pertained to a widely used philosophy textbook. His is a broader point regarding the reigning paradigm in the philosophy of mind--and, as that poll he posted a few days back shows, that paradigm is undeniably atheistic and naturalistic. To conclude that a couple of objections raised on a personal blog have been unsatisfactorily (in your eyes, at any rate) answered is in any way comparable to Churchland's torching of strawmen is ludicrous. Besides, there are several thoughtful commentators here such as the Codgitator, James Chastek of "Just Thomism", and Brandon (aka "Sirus")who have given many well-reasoned responses to naturalistic/fideistic/athiestic objections. A brief trek through the blog archives will reveal this much. And just a glance at my own bookshelf reveals three books penned by Dr. Feser, all of them written within the past four years. Between writing, teaching, and family matters, I seriously doubt the man has time to deal with every critical comment on his blog--especially when he's probably dealt with said criticisms in print or in the classroom countless times before. So, ease up a bit, okay; it's the holidays! Grab some cookies, some eggnog (and a little rum, if you're so inclined), and take a seat by fire\space-heater. Merry Christmas. I too think that characterization of events is utterly unfair. You can't be accusing Ed and others here of treating process theology/thought how Churchland and others have treated dualism or non-physicalism. Where has Ed attacked and dismissed strawmen of process theology/thought? What's more, Ed has defended views he disagrees with from what he sees as unfair objections - cartesian dualism, for example. He's pointed out that there are a variety of responses and alternatives to materialism, not all of them explicitly or at least traditionally theistic (neutral monism, panpsychism, idealism, etc.) He hasn't even presented the thomistic tradition as being perfectly singular in outlook and argument - see his entry on the variety of thomistic schools of thought, etc. I can understand you wanting Ed to talk more about process thought and theology. But even if he's not talking about it enough, or at all, it clearly is not "the same behavior and mindset" of what's being talked about with Churchland. If one says, "The hegemony of atheism and materialism crucially depend on a stubborn and studied ignorance of what theists and dualists have actually said. ),"
The situation as I am coming to feel it is that because process thought is difficult to study, not very broadly appreciated in popular philosophy, little known (and so distrusted) by Catholics, and because process theology is associated with liberal Protestantism, there exists a stubborn and studied refusal to consider its relevance in contributing to Ed’s discussion blog. “So, ease up a bit, okay; it's the holidays! Grab some cookies, some eggnog (and a little rum, if you're so inclined), and take a seat by fire\space-heater. Merry Christmas.” Back at ‘ya. Merry Christmas! Oh yes I can – process ideas posted here are neglected/dismissed w/o serious hearing in a manner very much like you guys feel the Churchlands, et al, dismiss A-T principles with a casual wave of the hand. And, what is worse, to be attacked or ignored? You are wrong, so apologize. O.C. and Crude very politely explained to you why you were being unfair. You should have taken the opportunity they gave you to back down. The reason I haven't addressed process thought here has nothing at all to do with disrespect for it. In fact I have great respect for Whitehead and Hartshorne, and I have never once dismissed them, or process thinkers generally, the way Churchland et al. dismiss dualism. So there is no basis whatsoever for your rash charge. Do you really expect me to drop everything and jump onto some new topic every time someone in a combox, or on another blog, or in an email, raises his own pet issue and asks for my opinion on it? I'd be doing nothing else. Sorry, I'm busy enough as it is. Will I say something about Whitehead and Co. at some point? Maybe, but if so, I'll get to it when I get to it. I've got plenty of other stuff I intend to get to first. So, please try to get a little perspective. And have a Merry Christmas. I follow my hunces, and they are usually quite prescient. However, I will not press the issue that in all the delineated topics in my previous comment (I left out many others) which at the time related to the blog-of-the-day, you replied to almost none. Can any of you direct me to a blog where I can find an open-minded discussion of process philosophy and theology? I do not reply to most comments -- look around, you'll see you are hardly alone. Why don't I? Because between teaching, marking exams, working on articles and books, writing up blog posts, a wife and five kids, Christmas shopping, etc. I simply DON'T HAVE TIME to reply to most combox comments. Much less launch into an impromptu off-topic exchange over process theology. Most readers realize this, which is why they don't whine about it. Stephen Braude has praised Griffin's book on parapsychology, as a good contribution to the field, and Griffin as one of the few contemporary philosophers who has actually studied the evidence. I think Dr.Griffin's process philosophical approach is very good and interesting, and his version of pansychism (pan-experientialism) is the best that I know of. However, I have some problems with the idea of a naturalistic theism, and some of Griffin's criticism to dualism seems to be easy to respond by contemporary dualists. So I agree with you about the relevance and importance of Whitehead's philosophy as defended by Griffin, even though I don't support this view. Anonymous, Mark Crookes wrote two excellent papers criticizing Daniel Dennett's philosophy of mind. A couple of weeks ago, I received from a friend both papers (they're not available online anumore). Interested readers can write me an e-mail, and I'll send you the papers. Personally, I'm very interested in aspects of process thought - I've brought up panpsychism on this blog a number of times, and have been interested in panentheism. More and more it seems that Aristotle and Thomism provide some tremendously important and ignored insight, but I'm happy to learn about alternative views. I would point out, at least on his quick summary on the wikipedia webpage, it would seem that Griffin has ideas that mirror those of Ed's and other thomists/Aristotleans - I'm thinking particularly of the criticism of the mechanistic picture of the world. That is one point that Ed and others certainly do not ignore. That said, Burl.. if you should be annoyed at anyone for ignoring (and no, I don't think that's nearly as bad as actively strawmanning) process thought, maybe you should be upset with David Ray Griffin. Given you and Jime speaking highly of him in this thread, I decided to search around and see what I could come up with. I realize that the issues he speaks about (9/11, etc) are no doubt very important to him, but it almost seems as if all talk of process thought and philosophy has fallen by the wayside for him. At least, that seems to be his driving interest for the past few years, and is what most people are talking about in relation to him. For the record, I do know that Henry Stapp bases a lot of his views on Whitehead. So maybe he'll be of interest to you as well, though you've probably read his writings already. Dr. Feser said: "Do you really expect me to drop everything and jump onto some new topic every time someone in a combox, or on another blog, or in an email, raises his own pet issue and asks for my opinion on it? I'd be doing nothing else." I'm among those who have requested the good professor's input on (or at least perusal of) some of my own blogging, and despite the fact that I'm a kind of an A-T fanboy, he's not responded to me about most of it. Do I take it personally? Of course not. He's doing lots of fine work already. So, Burl, I think the general thrust in response here is on target: it's not a personal snub against you or processism. It's just the breaks. P.S. You seem to brandish the charge that Christian orthodoxy (esp. its classical anthropology) -- as imperialized by Contantine and codified by Aquinas [ummm... Dan Brown, anyone?] -- entails (entailed) the degradation of animals and nature generally. (You're channeling Lynn White, Jr., right?) But I wonder. A few weeks back I and others critically, civilly, and substantively engaged your views about human vs. non-human rationality, showing that the hierarchy of sentience is more an a posteriori ordering than an a priori chauvinism. Also, I wonder what's more degrading to animals: letting them be themselves in their own non-human way, or tying ideological strings to their limbs to make them walk and talk like us and clothing them in human clothes to be like us? In any case, it's just historically naive to say that animals only -- or actually, for that matter -- get "short shrift" in Christian milieux. Do you have any idea how neglectful and exploitative people are, historically and currently, of dogs and cats, etc. in Asia (which is a mostly Buddhist setting)? In eastern Orthodox and Catholic rites, animals are fed first at Christmas since they were first with Christ in the manger. On St. Francis d'Assisi's feast day, animals are honored and blessed in the Mass as fellow creatures. How do such facts mesh with your anthropocentric argument against A-T? Burl: dig into this bibliography. I must plead a good degree of ignorance when it comes to the nature of blog posts and their consequent comment posts. The only other blog I commented on had a small following, and every comment was addressed. I know this is not the case here, of course. And since the majority of my comment points are relevant but divergent from your blog, I understand that you would need to spend more time replying to them than to those that are more sympathetic. That said, you might consider with me that your silence during many lengthy discussions I had with your blog commenters on alternative or opposed views to those in the blog is easy to perceive as being akin to the laissez faire attitude of Churchland towards your ultimate concerns. You and I both feel dissed when there is a real or perceived “stubborn and studied ignorance” of our concerns. I apologize for misreading your thoughts; maybe you could ease up on the Churchlands, et al. If you wish, I will forego further comments here with no hard feelings. The reviewer’s Notre Dame apologeric interests notwithstanding, I am compelled to read Benzoni’s book, though I much prefer to read well-constructed essays. Just the abstract in your linked index exudes my whole sense of the issue at hand. Not to get sexist, but I think a female’s perspective of animals is so much more natural and whole (holy) than what comes from the typical philosophical male. You can see this difference in the volunteers at the no-kill shelter; I see it in my wife’s interactions with our shelter adoptees. Makes a subsistent soul just plain irrelevant to our fellow creatures. The commenters of Ed’s blog have been quite open to my interests, and very helpful in furthering my thinking – for which I am grateful. I do not expect to see a blog surface just because it is of special interest to me. Of course, I would love to see some! For Christmas I got your book "Aquinas" and "The Last Superstition". Right. On the one hand, we've got someone who doesn't respond to a couple among many dozens of ephemeral blog combox comments because he doesn't have time. On the other hand, we've got someone writing a formal textbook on the philosophy of mind, destined to be used for many years and to influence the views of countless students, who ignores some of the key arguments in the field. Absolutely brilliant analogical reasoning there, Burl. Thank you! Hope you enjoy them. Merry Christmas! I think it's a good explanation of Aristotle's causes and the first unmoved mover. It's a good complement of many of the explanations about Aristotle's metaphysics discussed in this blog. Professor Feser I very much respect your willingness to believe that Professor Churchland may not be intentionally purveying straw-man depictions of dualist arguments as a sort of nefarious plot to discredit dualism as a serious position among young philosophy students, but with all due respect, do you really think he has no idea what he's doing? As you noted at the beginning of your book "Philosophy of Mind," all of philosophy, and particularly philosophy of mind, is connected. A devout Materialist and Naturalist like Churchland knows that while Dualism might not in principle render Naturalism false, it certainly does not seem to fit into the Naturalistic worldview very well at all, and could very reasonably cast doubt on that worldview as a whole. For a parallel, we could imagine that if a devout Atheist was suddenly presented with undeniable evidence of the existence of ghosts, while this would not in principle disprove his Atheism, it would obviously not fit well with the view. Once the ghosts are allowed in, the angels and the Lord are not far behind. From a Naturalist's perspective it seems easy to see that the same would hold with the Dualists'(particularly the substance Dualists') immaterial mind. Thus it does seem plausible that Churchland might have knowingly forsaken the quest to find the best arguments to represent Dualism in his "textbook." He is, without question, a very intelligent man, and he also very obviously sincerely believes Naturalism is true. But, as is so common with Naturalistic/Atheistic academics in today's world, who like to pretend that they are assessing any number of religious questions with objectivity when they are perfectly aware of the preconceived stance that they are taking, he also undoubtedly feels that fighting the good fight, and promoting materialism over "irrational," "superstitious," "prescientific" views like Dualism is important. To me, his actions do seem to constitute dishonesty, and his straw-man presentation does therefore seem to be at least partly intentional. I actually have a different playful suspicion, Anon. I recall Van Inwagen once saying flatly that he thinks there are next to no (possibly no) arguments on any philosophical issue of interest that would suffice to compel belief in a truly agnostic third party. I sometimes wonder if some people - whether they're philosophers, scientists, or otherwise - either believe or strongly suspect this, and as a result devote themselves to knocking down ideas they dislike for reasons other than knowledge/reason, promote ideas they like for the same, etc. But I'm just some anonymous schmo, so that's just a shot in the dark. I think that's an excellent observation actually, and I completely agree. From my own experience it does seem that frequently philosophers (and I mainly have experience with the heavily Naturalist department at my own university, though I would suspect this generalization holds generally) have made up their minds in advance to what is true and merely use their arguments to support such premises; as David Stove said "[their] hearts have determined in advance what conclusions the arguments will favor." Of course, I think the irony of Stove's quotation is twofold; firstly as I have observed (and I expect you would agree) this tendency to let the heart lead and the reason follow is not at all limited to Christian/Catholic/religious philosophers. The same way that a die-hard creationist has little interest in what the latest Biology textbooks have to say about evolution, most Naturalists have little interest in what Christian philosophers have to say about the coherence of Theism. The Naturalists "know" (as Ed so well explains in his book) that there is no God and needn't search for any further knowledge to the contrary. But the real sort of irony in what Stove says is that as all of this shows, Philosophy has, in modern times, almost become merely a means of winning arguments (or at least that's the way the modern public seems to perceive it, which renders it less important in modern culture.) Rather than being the "handmaid of theology" (as Aquinas said) it has moved to being the "handmaid of science." But what a sad state of affairs this is! Philosophy was once (in the time of Aristotle for instance) considered a search for objective, mind-independent truth in and of itself, yet has now been relegated to merely representing a defense of what any given group of people considers important and true. And the irony in Stove's comment is that his own intellectual hero (David Hume, among others) helped usher in this state of affairs, as Ed points out so well in TLS. If he is upset that so much philosophy is not done objectively, it is really his own camp of radical empiricists and Naturalists that are to blame. It is frankly, disgusting though. I've read enough on this blog and seen enough rude, thoughtless comments, (Bertrand Sagan comes to mind) from "freethinkers" who display absolutely no interest in hearing or listening to what we have to say, to see that the heart seems to dictate what most people believe before they even start to think about it. And while Ed's arguments are clearly true and his reasoning sound, I confess that it sometimes seems like a hopeless struggle to me. How can you show people the truth if they refuse to open their eyes? Oh well. I suppose that's a question for greater minds than mine to ponder. As I said to many here in an earlier comment on another of Ed’s blogs (we were discussing creatures), one cannot easily alter hard-held convictions of another mind. The thing you can do is to engage someone’s ideas with careful attention to their viewpoints in mature, polite give-and-take conversation – never go ad-hominem. Frank, open-minded idea exchanges will follow. The alternative leaves us with two talkers and no listeners. For example, in that same comment I asked a question that nobody took me up on. No one could believe that conscious creatures were little different one-from another. I asked that you search your memory for the most compelling argument ever given that might make you think other than you do on the topic. This is similar to asking a debater to debate in favor of the opposite view that he holds – it is a good exercise in empathy. Not much of that goes on anymore. I'd agree with much of what you say. Though I actually don't think that the problem is philosophers aren't open-minded or realize they could be wrong. Indeed, my point was the opposite - that they realize they really can be wrong, that others can be right, and that there may be no way (either in near- or long-term) to truly be compelling to an honestly agnostic third party. The very idea that there may be some reason for doubt is terrifying. Hence the abundant faith while at the same time anger at the idea of faith. Go figure. "I am not claiming that Churchland is knowingly perpetrating what looks like a pretty sleazy rhetorical tactic. I think he is, like most materialists, simply ignorant of what most dualists have actually said." I, on the other hand, have little difficulty in saying so ... and saying so on the basis of just the sort of "scientific" reasoning of which 'materialists' are so fond. Is it *really* plausible that a person in Churchland's position would out of simple ignorance misrepresent and/or ignore the main arguments of the position he wishes to denegrate? OR, is it more plausible that what looks to be a "pretty sleazy rhetorical tactic" on his part *really is* a pretty sleazy rhetorical tactic? Does not the question all but answer itself? "Scientifically." "He no doubt thinks he knows enough about what they say to be justified in concluding that their position is not worth looking into any further than he already has. He is wrong, but will never know that he is, because he has gotten himself onto the sort of merry-go-round that (as we have seen in recent posts) naturalists seem to have so much difficulty keeping off of: “I know that dualism is too silly to investigate any further because of how bad the arguments for it are; and I know that I must be understanding those arguments correctly because dualism is obviously just too silly to be worth investigating any further.”"
To engage in circular reasoning is always an intellectual failure. To knowingly and deliberately engage in circular reasoning is a moral failure, besides: intellectual dishonesty. It would be interesting to know how many of the comments on this blog are from those who were raised in the Catholic tradition from an early age? "It would be interesting to know how many of the comments on this blog are from those who were raised in the Catholic tradition from an early age?" Is that anything like saying, "It would be interesting to know what proportion of those who assert the Churchlands' position engage in fornication or adultery and/or promiscuity?" This post brought to you by the word "striver."